Lewis Hamilton says Formula 1 title rival Sebastian Vettel has received too much criticism this year. 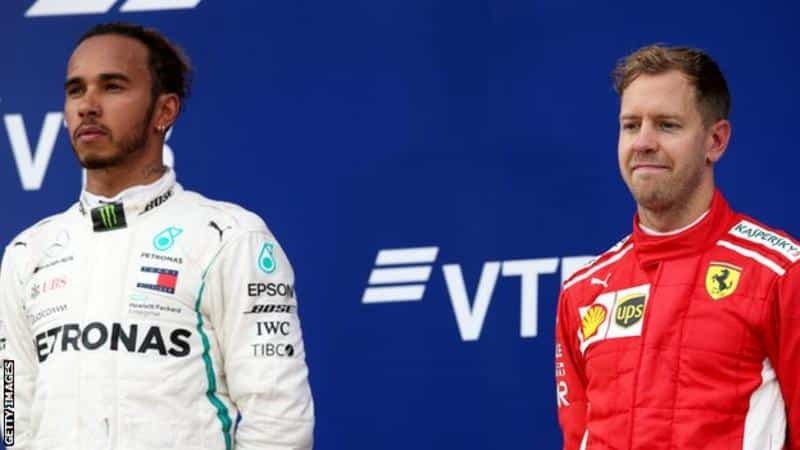 Hamilton can win a fifth championship at the next race in Austin, Texas, partly because of a series of errors by the German and his Ferrari team. The British Mercedes driver said: “I feel the media need to show a little more respect for Sebastian. Vettel and Ferrari were fighting a close battle with Mercedes for much of the championship but their season has unravelled partly because of a series of errors, even before Mercedes found an extra gear at the Singapore Grand Prix in mid-September. Four-time world champion Vettel has made small but costly errors at races in Azerbaijan, France, Austria, Germany, Italy and Japan, and Ferrari have made a series of operational errors that have also hit the team’s hopes. Vettel also attracted criticism for his collision with Max Verstappen at Sunday’s Japanese Grand Prix. Vettel said after the Japanese Grand Prix: “There is still a chance. We made it a bit too easy for them in the last couple of races. Credit to them they executed well, but we need to look after ourselves and do our bit and then we see. “The last weeks have been tough for us but overall we could be in a better place. We are not. “But we look forward and even if the last weeks have been difficult, the spirit inside the team, if you look at the guys, it is incredible how strong, positive and powerful they are.